Joel Rosario, who rode two winners on Friday's Breeders' Cup card that included of five Championship races, leads in the race for the Bill Shoemaker Award, given to the most outstanding jockey of the Breeders' Cup World Championships at Churchill Downs. The Shoemaker Award is based on a 10-4-2-1 scoring system on first- through fourth-place finishes in each of the 14 Breeders' Cup World Championship races. 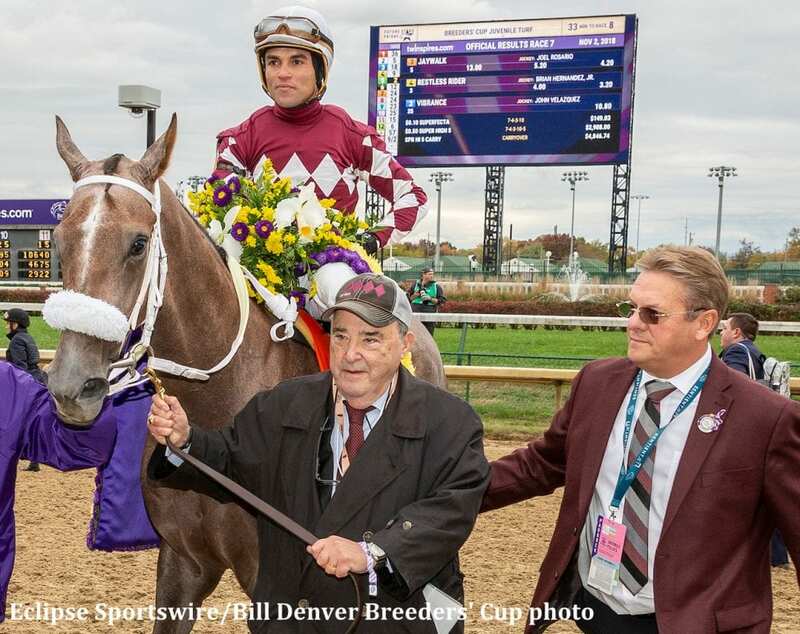 Rosario's two victories came in both $2-million races, the Sentient Jet Breeders' Cup Juvenile (G1) on Game Winner and the Tito's Handmade Vodka Breeders' Cup Juvenile Fillies (G1) on Jaywalk. His 20 points put him six in front of Irad Ortiz Jr., who won the Breeders' Cup Juvenile Fillies Turf (G1) on Newspaperofrecord and finished second in the Breeders' Cup Juvenile Turf (G1) on Uncle Benny. Other riders picking up 10 points for victories were 2017 Shoemaker Award winner Javier Castellano in the Breeders' Cup Juvenile Turf Sprint on Bulletin and William Buick on Line of Duty in the Breeders' Cup Juvenile Turf (G1). The Shoemaker Award is named in honor of one of the greatest jockeys in the history of Thoroughbred racing. Shoemaker, who captured the Kentucky Derby four times, won more than 8,800 races in a career that spanned more than 40 years. In 1987, at age 56, Shoemaker won the Breeders' Cup Classic aboard Ferdinand at Hollywood Park. This entry was posted in People and tagged 2018 breeders' cup, bill shoemaker, bill shoemaker award, churchill downs, game winner, irad ortiz jr, jaywalk, joel rosario, shoemaker award by Press Release. Bookmark the permalink.